Digitization offers new ways of bringing integrated products to market faster, reducing costs, automating complex processes and introducing new business models such as product-as-a-service. “By performing real-time monitoring of external voices (Voice of Factory, Voice of the Asset, Voice of the Customer) via IoT or social media, factory operators can get a comprehensive and customer-centric view and apply AI and machine learning to their decision-making processes,” explains Ulf Köster, Solution Director of Digital Transformation Solutions at Oracle. Köster argues that the precondition for successful digital transformation consists of maintaining a continuous connection – integrated, intelligent and optimized – between processes and data running like a leitmotif along the entire supply chain – from product development and planning to production, commercialization and after-sales service. Abas Software is also a provider of digitization strategies and activities along the supply chain, with ERP playing an important role. “We regard the ERP system as the foundation for digital transformation, because it goes beyond mapping just the critical business processes,” says Mark Muschelknautz, Chief Marketing Officer of abas Software AG. “Within the framework of IoT, Industry 4.0 and connected production, ERP is also having to master new challenges, such as the flexible, real-time monitoring of processes and machines, the aggregation of data in interaction with new analysis tools, and process control to satisfy compliance requirements,” he adds. 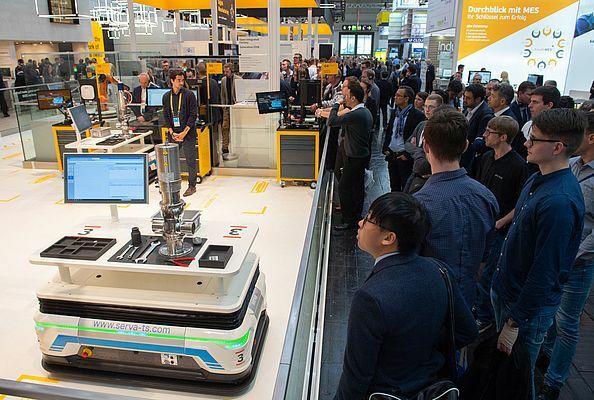 The companies in halls 5, 6, 7 and 8 at HANNOVER MESSE will be answering the gamut of software questions along the industrial supply chain, thus developing the prerequisites for the object of the world’s leading trade fair for industrial technology in 2019: Integrated Industry - Industrial Intelligence, i.e. the digital connectivity of people and machines in the age of artificial intelligence.